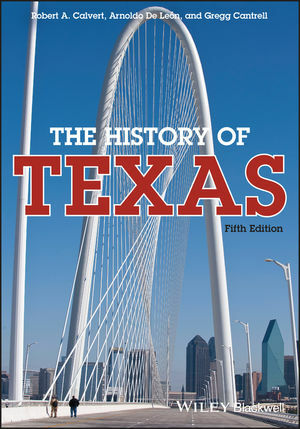 The History of Texas is fully revised and updated in this fifth edition to reflect the latest scholarship in its coverage of Texas history from the pre-Columbian era to the present. Robert A. Calvert, a fifth-generation Texan, was Professor of History at Texas A&M University, where he taught for more than twenty-five years. He received his B.A. and M.A. degrees from the University of North Texas and his Ph.D. from the University of Texas at Austin. A former President of the Texas State Historical Association as well as a Fellow and Honorary Life Member of that organization, Dr. Calvert wrote or edited numerous books and articles, most of them on Texas history. Arnoldo De León is C. J. “Red” Davidson Professor of History at Angelo State University, Texas. He is the author of several works on Texas and Mexican American history, among them The Tejano Community:1836-1900 (1982, 1997); Mexican Americans in Texas: A Brief History (1993, 1999, 2009); Racial Frontiers: Africans, Chinese, and Mexicans in Western America, 1848-1890 (2002); and editor of War Along the Border: The Mexican Revolution and Tejano Communities (2012); and co-author of North to Aztlán: A History of Mexican Americans in the United States (2006). His numerous awards and distinctions include selection as Fellow of the Texas State Historical Association and membership in the Texas Institute of Letters. He was the recipient, in 2013, of the National Association of Chicana and Chicano Studies’ Premio Estrella de Aztlán Lifetime Achievement Award. Gregg Cantrell is the Erma and Ralph Lowe Chair in Texas History at Texas Christian University. He is the author or editor of numerous works on Texas history, including Lone Star Pasts: Memory and History in Texas (2007), Stephen F. Austin, Empresario of Texas (1999), and Feeding the Wolf: John B. Rayner and the Politics of Race (2001). He is a member of the Texas Institute of Letters and Fellow of the Texas State Historical Association, of which he served as President, 2013-2014.